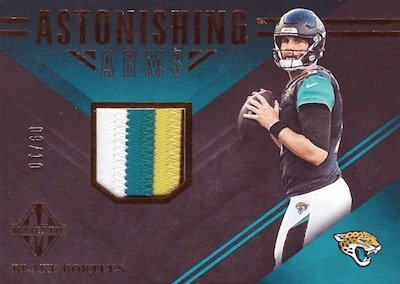 Providing year two of the early-season brand, 2018 Panini Majestic Football puts a premium spin on the NFL with a black-heavy design. The format sees a slight tweak from 2017, keeping the four autographs per box but dropping down to two memorabilia cards (instead of four). 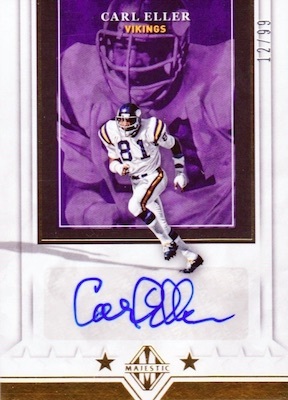 Each hobby box also includes one base card and one base parallel. 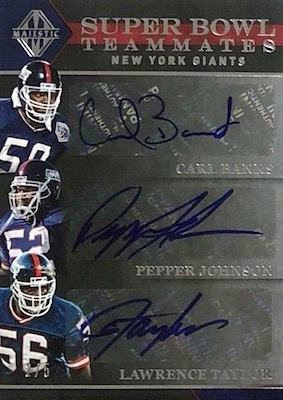 2018 Panini Majestic Football offers a few reasons to explore the autograph lineup, with a total of four signed cards per box. 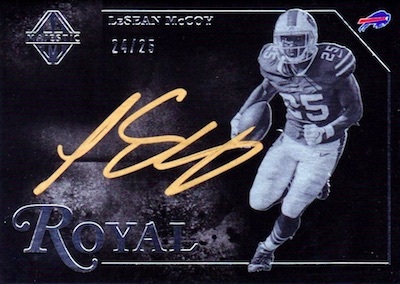 Leading the way, on-card autograph sets consist of Magnificent Signatures, Marvelous Signatures (#/99 or less) for the best receivers, and Royal Signatures (#/99 or less) for the best running backs. The new Majestic Tier Signatures breaks down into different levels that are limited to 99 or less. The 100-card set includes rare Tier 4 subjects, which are capped at no more than five copies. 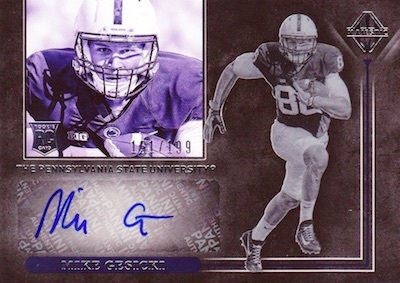 First-year stars are also a focal point of the 2018 Panini Majestic Football checklist. 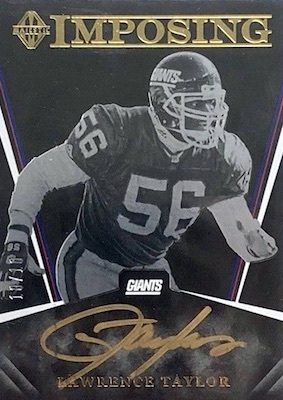 This includes the earliest autographed memorabilia cards for the 2018 NFL Draft class. 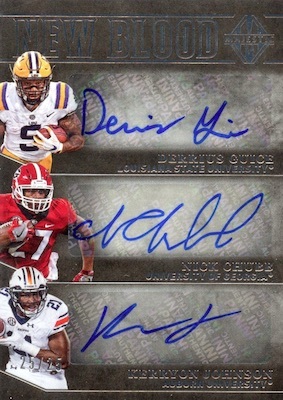 Majestic Rookie Signatures (#/299 or less) and Rookie Scripted Swatches both have a college theme. Meanwhile, New Blood Signatures, numbered to 49 or less, groups a trio of incoming rookies by alma mater or position. Each box should contain one autographed relic card for a rookie. 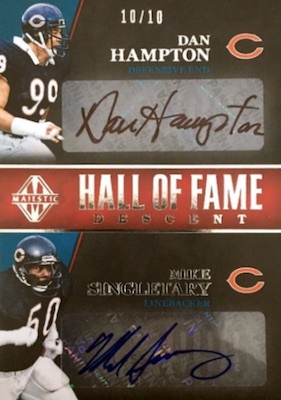 Other multi-player autographs appear in dual Hall of Fame Descent Signatures (#/25 or less) and triple Super Bowl Teammates Signatures. 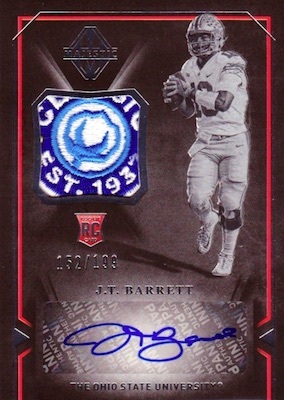 More combo choices come via Black and Blue Signatures, Ring Bearers Signatures, and Team Signs Signatures. 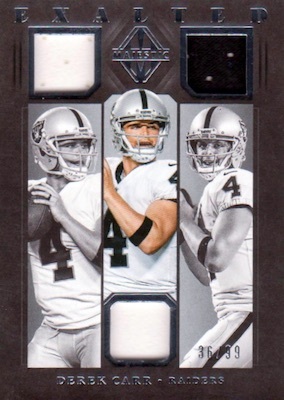 The final two hits in each 2018 Panini Majestic Football box feature a relic piece. 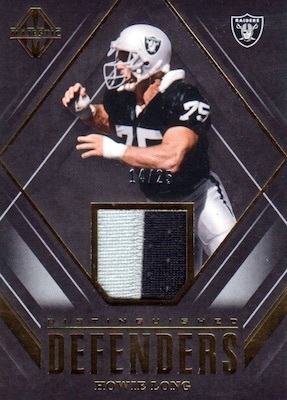 Majestic Material is a new option that has low-numbered Patch (#/5), Gold Brand Logo (#/2) and Platinum NFL Shield (1/1) parallels. 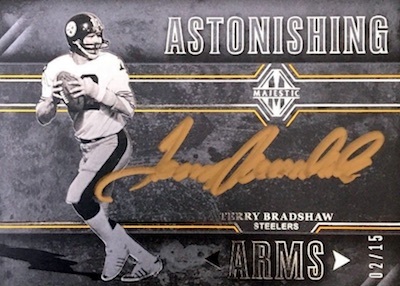 Additional memorabilia inserts include Astonishing Arms, Distinguished Defenders, Exalted Materials, Icons Materials, Regal Runners, Show Stoppers Materials, Unsung Warriors Materials and Wondrous Wideouts. 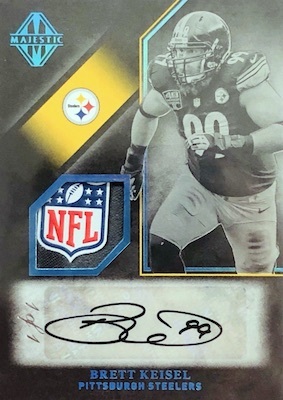 View 2018 Majestic NFL cards on eBay. 100 cards. Serial numbered #/75. PARALLEL CARDS: Gold #/50, Holo Silver #/25, Holo Gold #/5, Platinum 1/1. PARALLEL CARDS: Gold #/49 or less, Holo Silver #/10 or #/5, Holo Gold #/5 or #/3, Platinum 1/1. PARALLEL CARDS: Gold #/99, Holo Silver #/25, Holo Gold #/10, Platinum 1/1. PARALLEL CARDS: Holo Silver #/25 or less, Holo Gold #/5 or less. PARALLEL CARDS: Gold #/10 or #/5, Holo Silver #/5 or #/3, Holo Gold #/3 or #/2, Platinum 1/1. PARALLEL CARDS: Gold #/49 or less, Holo Silver #/25 or less, Holo Gold #/5 or less, Platinum 1/1. PARALLEL CARDS: Holo Silver #/10 or less, Holo Gold #/5 or less. PARALLEL CARDS: Gold #/3 or #/2, Platinum 1/1. 5 cards. Serial numbered #/3. PARALLEL CARDS: Gold #/2, Platinum 1/1. 25 cards. Serial numbered #/25. PARALLEL CARDS: Gold #/10, Platinum 1/1. 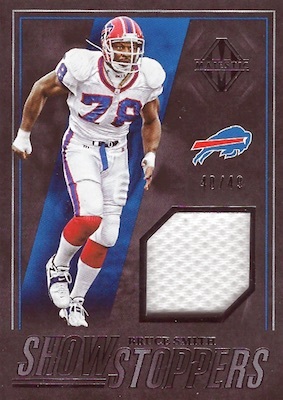 PARALLEL CARDS: Gold #/25 (Ray Lewis #/10*), Platinum 1/1. 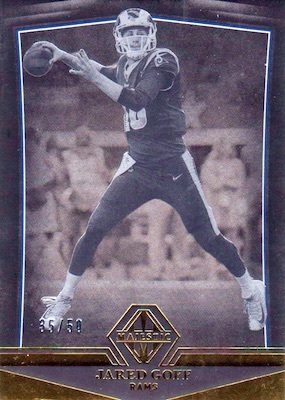 PARALLEL CARDS: Gold #/49 (Brady #/3*), Platinum 1/1. PARALLEL CARDS: Gold #/25 or #/10, Platinum 1/1. 25 cards. Serial numbered #/5. PARALLEL CARDS: Gold #/25 (No Grimes*), Platinum 1/1 (No Edelman*). 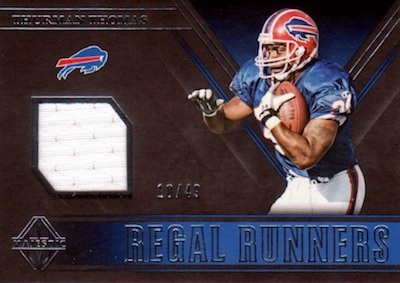 PARALLEL CARDS: Gold #/49 (No Tim Brown*), Platinum 1/1 (No Tim Brown*). 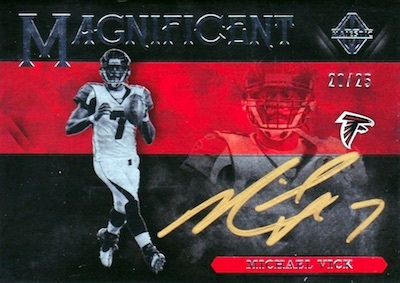 View the 2018 Panini Majestic Football checklist spreadsheet. Nice checklist. Love any product with good assortment of vets rookies and stars. They really need to renegotiate their contract with the NFL and reduce their number of releases to about 5. Releases like this are garbage I can’t beleive they make money on trash like this and many other of their releases. However, forcing resellers to buy this crap in order to stock the good stuff is probably why they aren’t in the red. 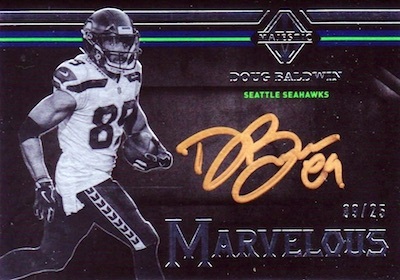 I don’t mind sticker auto’s, but when a box is close to $300, that is not what I would expect. Not all that fond of the look either. Seems like a miss to me. 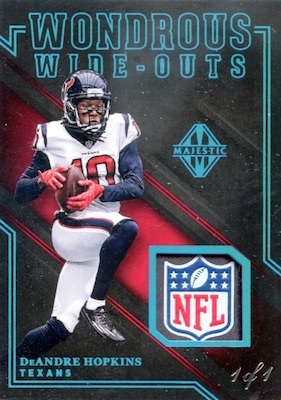 seeing this garbage makes me happy i gave up football cards last year. Just an unbelievable ripoff with little value. It’s just hoops and baseball for me.